Before Hulu launched in March 2008, watching TV shows on the Web was more fun in theory than in practice. 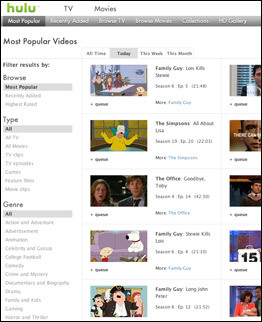 If your show was even available online, you had to hunt for episodes on cluttered network-TV sites, then view them in Post-it-size boxes onscreen. Hulu changed all that by housing dozens of current shows from Fox and NBC, like The Simpsons, House and Late Night with Conan O'Brien, as well as hundreds of golden oldies like The Bionic Woman and Fantasy Island, all under one roof. What's more, Hulu's Web viewer has a full-screen mode and streams high-quality video. Added bonus: way less commercial time. For a bigger warehouse of TV clips and non-network shows, check out Modern Feed.